Madonna is moving to Portugal to support her son in a football career – but she’s far from the first celebrity to call the country home. Queen of pop, Madonna, is planning a move to Lisbon, according to a Daily Mail report. She has apparently already chosen a home on the outskirts of Lisbon for £5 million, which still goes a long way in Portugal’s high-end property market. The reason for Madonna’s move is so that she can support her adopted son, David, in taking a place in Benfica football club’s junior team. The youngster is reported to have impressed bosses there during a recent one-week trial. David currently plays for a New York under-14s team, Downtown United Soccer Club. Madonna reportedly plans to move to Portugal with David and three more of her youngest children, including recently adopted twins. It’s thought that they will attend the prestigious French Lycée school in Lisbon. 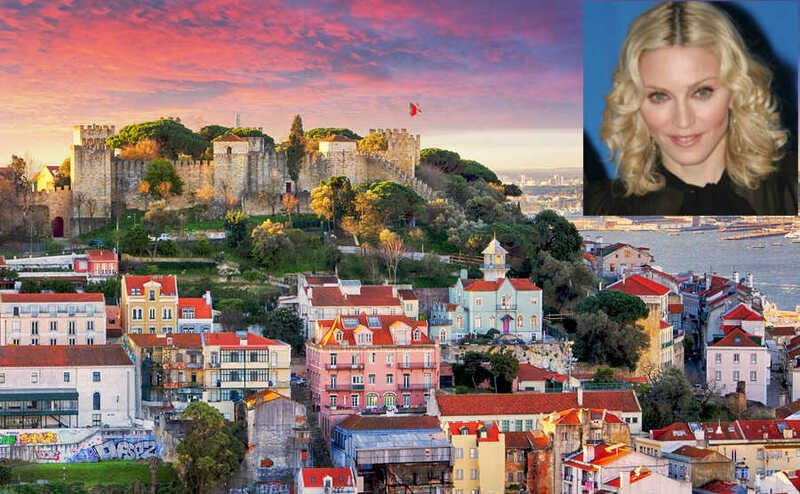 Madonna is not the first celebrity to choose Lisbon as home. Bloomberg recently reported that French footballer/philosopher Eric Cantona, Italian actress Monica Bellucci and designer Christian Louboutin also live there. It’s not just Portugal’s capital that attracts the big names. The Algarve has long been known as a celebrity haunt, with Cliff Richard the name that comes up the most. Sir Cliff produces wine in the region at his Vila Nova vineyard, which he’s owned for many years – although it was reported last year that the site was up for sale. Dragon’s Den star Duncan Bannatyne is also well-known for enjoying his home in the Algarve, frequently tweeting pictures from his mansion in Vale de Lobo. Last year we revealed [LINK to 27 September 2016 article on Bannatyne] that he’s now getting involved in property development in the area. If you want to visit Portugal to begin your own property journey, download our free viewing trip guide. The list of stars mentioned so far merely scratches the surface. Philip Schofield also owns a place in the hills not far from Bannatyne’s luxury pad, while property expert Jasmine Harman was “discovered” as a local radio DJ broadcasting to the British expat audience. Bonnie Tyler and Angelina Jolie are well-known faces in the Algarve, but it’s the footballers who outnumber celebrities of all other types in Portugal. You can barely drop kick a football in the Algarve’s golden triangle without a former premiership footballer heading it back to you. Ronaldo, the country’s own superstar, hails from the island of Madeira and has property and business interests across Portugal. Stephen Gerard, José Mourinho and Teddy Sheringham are also all known to have Algarve boltholes in the sun. Madonna certainly won’t have a shortage of big-name friends to hang out with when she gets to Lisbon.